Once you become a member of Royal Caribbean's customer loyalty program, Crown and Anchor Society, and embark upon another cruise, you will start getting invitations to special events and parties just for you. These parties are special ways Royal Caribbean likes to recognize its repeat customers and offer them complimentary beverages, share upcoming news about the ship and answer questions. What happens at these parties? Usually you are greeted by the ship's officers as you walk in and served complimentary cocktails and snacks while you mingle with other guests. After a little while, there's a speech or two given by officers such as the loyalty ambassador, hotel manager and even the Captain. Which crew members speak varies from ship to ship and sailing to sailing. Royal Caribbean will offer a few parties each cruise for Crown and Anchor Society members of each level. Royal Caribbean will deliver an invitation for each party to your stateroom to let you know of the event. On newer ships, such as the Oasis-class, the invitations are electronic and will arrive in your television's message inbox. How many events are there per cruise? 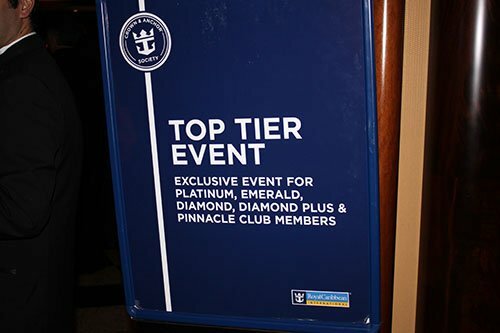 Royal Caribbean will hold a number of events, usually a general event for all Crown and Anchor members and then smaller events for members of higher status in the program. 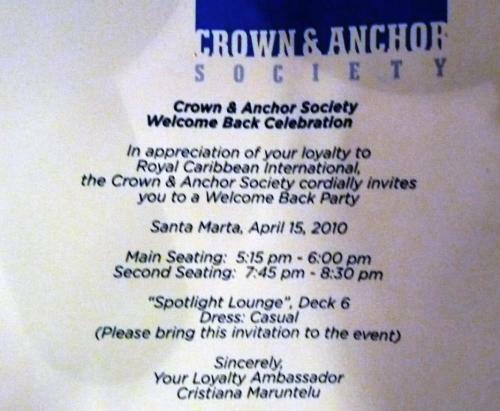 The main event is the Crown and Anchor Society Welcome Back Celebration, which is a general celebration of repeat cruisers. After that, there can be other events for Platinum and above members. The exact number of events and which events that are held will depend on the sailing. No, these events are optional and your attendance has no consequences. There are two really good reasons to go to these events. First, it's one of the rare opportunities on a Royal Caribbean ship to get complimentary alcoholic beverages. The wait staff will come around with plenty for everyone and it's quite easy to get multiple drinks per event. Second, the speeches by the staff can give you insight into upcoming changes onboard that ship as well as fleet wide. It's also a good opportunity to ask questions about changes you may have read about online or just wanted to get clarification of. Some speeches are more interesting than others but the free drinks and opportunity to meet other Royal Caribbean fans can be fun and the entire thing rarely lasts more than 60 minutes.